Looking for a cute way to display your Instagram pics IRL? You’re in the right place! There are so many gallery wall layouts to choose from on Pinterest so today we’re going to focus on one of our favorites – a heart-shaped photo wall! It’s super quick and easy to make with a selection of your favorite photos and as far as Instagram gallery walls go, this one’s pretty Instagrammable! 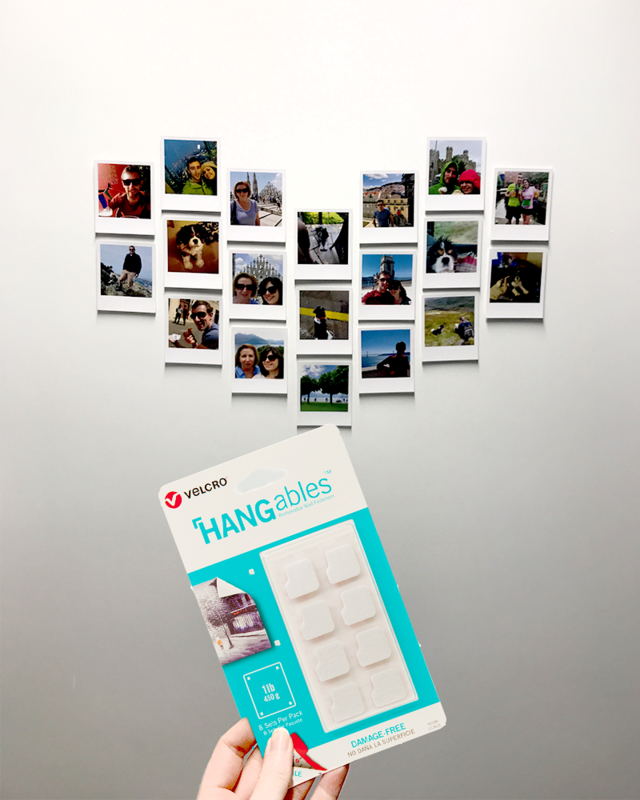 And to make it renter-friendly, we stuck our pictures to the wall with VELCRO® Brand HANGables® Removable Wall Fasteners that are perfect for hanging lightweight photos and posters without marking the walls with pins or tack. Take a look and let us know if you have a go at recreating it! 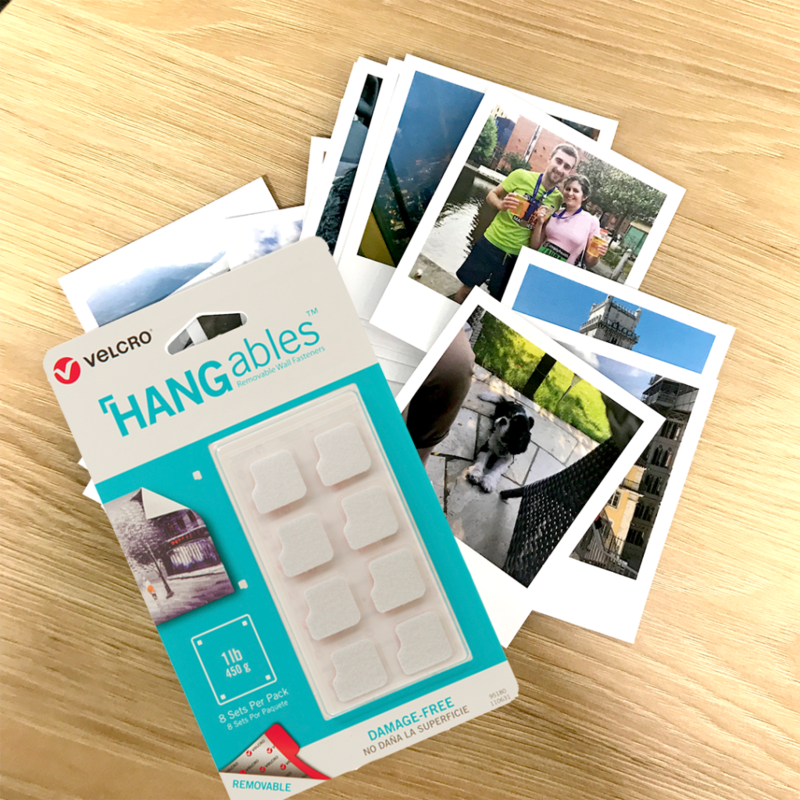 VELCRO® Brand HANGables® Removable Wall Fasteners (they come in packs of 8 or 16 sets and you’ll need one set per photo). Plan your layout in advance! When you’re making a heart shaped photo wall, it can be hard to get the layout right first time. We’d recommend testing your layout works by laying your photos in formation on the floor. It’s much easier to change your mind about the layout when your photos are on the floor than when they’re stuck on the wall! Use removable picture hanging strips. If you rent or just don’t want to damage your walls with pins or tack, we’d recommend using VELCRO® Brand HANGables® Removable Wall Fasteners that peel off easily without leaving marks. Start in the middle. It’s important to make sure your heart shaped photo collage is symmetrical, and the easiest way to do this is to stick the middle column of photos on the wall first and work outwards. The first step is to decide which photos you want to include in your Instagram gallery wall and print them out. To recreate this exact layout, you’ll need 19 photos but we’d recommend printing a couple more than you need so you have options. We chose to print our pics in a retro Polaroid style and print them all the same size but feel free to make your heart gallery wall unique by experimenting with different sized/shaped photos. Plan your layout by laying your photos out on the floor in formation. Once you have everything you need, you can start assembling your picture gallery wall! To stick your photos in a heart shape on the wall, you’ll need five columns of three photos and two columns of two. We’d recommend sticking the middle column up first and working outwards – this is the easiest way to make sure your photo heart is symmetrical. 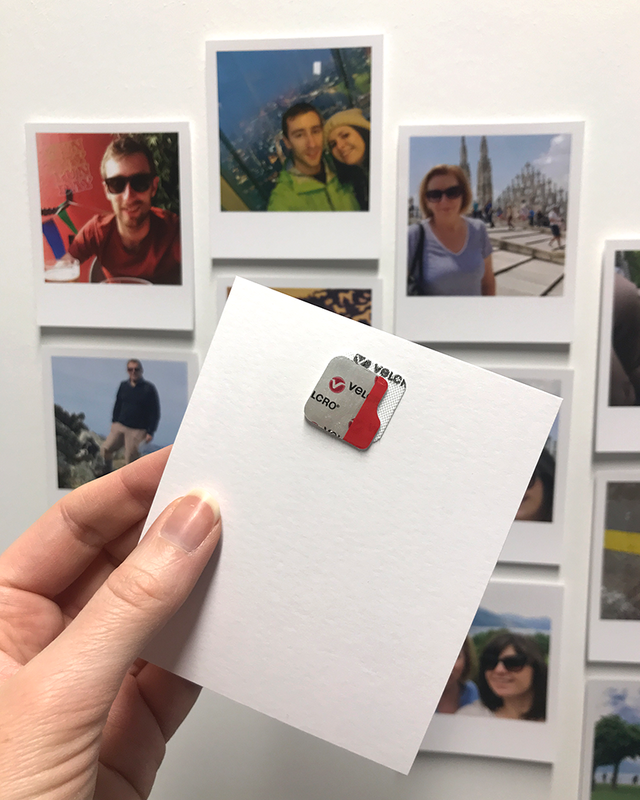 Attaching each photo to the wall is really easy – stick a set of VELCRO® Brand HANGables® Removable Wall Fasteners to the back of each photo and press it firmly to the wall. Last but not least, step back to make sure your heart shaped photo wall is straight and symmetrical, and make any adjustments that you need to. The beauty of using VELCRO® Brand HANGables® Removable Wall Fasteners is that they’re easy to peel off and re-position if you don’t get the layout right first time! And that’s it! 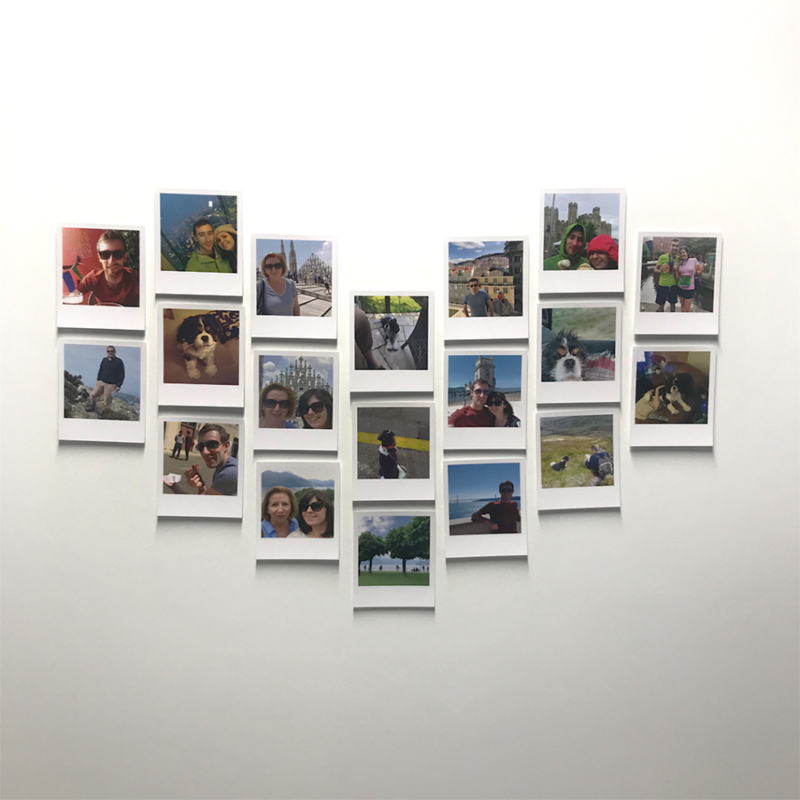 Let us know if you have a go at making your own heart shaped photo wall display with VELCRO® Brand HANGables® Removable Wall Fasteners! Or stay on our blog for even more home decorating ideas!